Italianate style Benjamin Harrison House, Indianapolis, Indiana. Designed circa 1874 by architect H. Brandt for the man who became the 23rd president. The 'wrap-around porch on the home's front and side elevations is a turn of the twentieth century Neoclassical style alteration. According to Historic American Building Survey, there was no 'front' porch on the house during Harrison's lifetime. 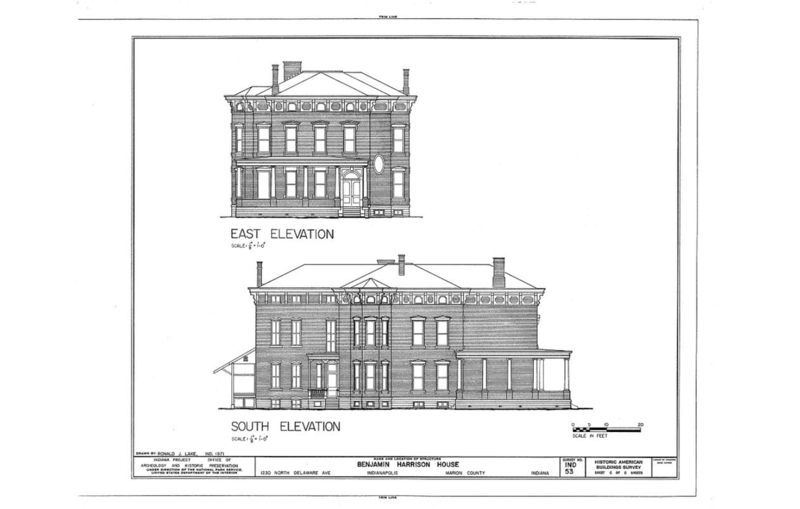 Historic American Building Survey, 1971. Italianate style Elliot Block, Indianapolis, Indiana. Designed circa 1875. The design was based on Italian Palazzo of the 1500's. The repetition of the sections cast iron ground floor, the cast iron and cast stone window decorations and the sheet metal cornice suited the basic elements of the style and were made possible through the use of these mass produced Victorian structural components and architectural decorations. Historic American Building Survey, 1970.